Genlisea Lobata. Image Courtesy of Flickr Creative Commons. 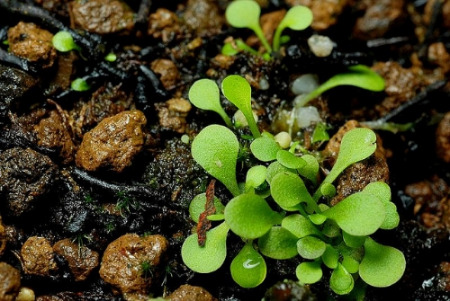 Within the family of carnivorous plants, there are some that take an unconventional route. These plants trap and consume their prey underground. At first glance, Genlisea Lobata looks to be an unassuming plant with bright green leaves and a purple flower, but what lies beneath is far more sinister. What would first appear to be long, pale roots, are actually leaves devoid of chlorophyll that contain small chambers with modified hairs to trap and contain organisms.